When you choose a book to read would you choose a Dystopian novel over one that shows a Utopian society? Or maybe I could re-phrase the question and say Star Wars or Star Trek which show would eliminate from existence if you had a choice? 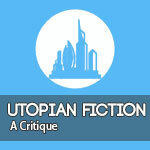 In the following video I'll explain why I prefer Dystopian fiction over and above a Utopian story. The sound is not as good as I wanted so I've added subtitles to the video, but you can also find the script that I worked of below. 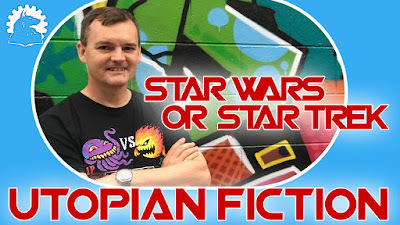 In this video I'll explain why I prefer Dystopian fiction over and above a Utopian story. This is how I feel, not about Star Trek, but about Utopian stories in general, I have trouble reading them. To me the Universe in which these stories are set should be as much a character as the Human and Alien characters and as such should have a believable back story (or history). The history of the Universe in which these Utopian societies are set need to be well thought out and allow us, the reader, to suspend our disbelief. But for me they don't and this is where The Cringe Factor comes in. 'we will just become better people because X'. Where X is normally some form of technological stimulation or a biological change (an evolutionary jump or some such thing) which make us nicer people. And like Adam Savage's critic of Star Trek, it lures you into a false sense of positivity. In my mind it's poorly thought out and not really fully considered. It's taken as a given that we will eventually work things out and all become 'good' people, however if you look at our recorded history you can see when the embers of a Utopia starts to form, here or there, it ends up being kicked over like a sand castle, normally by human nature. And here's my pet greve about utopian stories, even though these stories say 'we worked it out' and now no longer know the meaning of greed, violence and other shifty behaviour etc. the story line is normally moved along by showing these enlightened beings using all the traits that they said they eschewed to resolve the major plot conflict. Yeah, but it's story why does it matter? Getting the reader to suspend disbelief is critical for the author and also critical for the reader to be able to enjoy the story, but when characters go against the ideals of their Utopian society for the greater good then it totally destroys it for me. A major part of Science Fiction is the exploration of what does it mean to be human, and where we are going. If an author says we moved on and became better and have now been able to develop a Utopian society, then these characters need to act like they have been soaked in that culture and respond to conflict accordingly. This then shows us, the readers, who are living in a not so enlightened culture, that there are other paths we can take which allow us to move towards a better life, Utopia. In my opinion, a well thought out Utopian story needs to provide us, the reader, with clues as to how we can live to bring about a utopian society in real life. By having the Utopian characters going against their conditioning and resolving conflict as we, barbarians do, would seems to be a lazy way out. 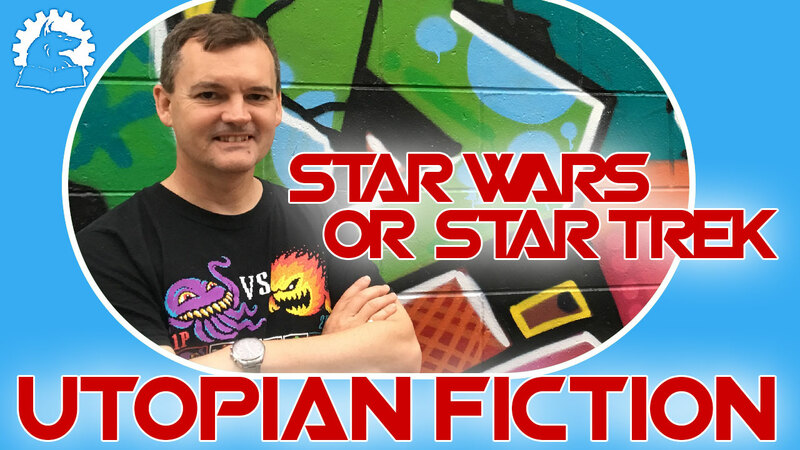 Would you rather live in the world of Star Wars, where the Empire monitors and oppresses its citizens or Star Trek, where Federation citizens work to better ourselves and the rest of humanity?